What is Practice Manager Pro? 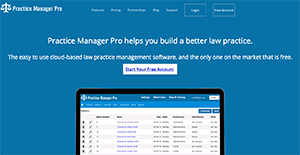 Practice Manager Pro is a cloud-based law practice management software offered by LegalSoft, a notable provider of technology solutions for law firms including website design, marketing, software to sell legal services online and software to manage their law practice. Practice Manager Pro offers everything law firms need to run their practice. Industry leading tools have been developed for the software to manage their cases, accounting, documents, tasks, compliance and many other tasks law firms need to run on a daily basis. The software handles everything from intake to invoicing, providing an all-in-one solution for law firms everywhere in this digital age. Practice Manager Pro helps its users manage their client matters. All the files of the client’s matter is kept all in one place as each matter collects the contact information, meetings, tasks, emails, letters, comments and other relevant information. Integrated security is also embedded in the system so users can easily search documents across the law firm in a secure setup. Users can even securely share with their client’s documents related to their case or even invoicing with the ability to monthly payments online, while keeping notes about important dates and reminders. Practice Manager Pro can also create documents in the software that will automatically customize to the client needs. They will be stored part of the client matter so all users in the firm will be able to review with the correct security permissions. In addition, it allows users to bill in a variety of methods, whether it is by the hour or by a flat fee. Billing is accurately tracked with trust accounting compliance. The software’s legal calendar entries can be linked to individual matters so that users can keep track of each cases meetings and deadlines. Multiple calendars can be created for different cases and teams, each can be set up with customized access. It is also easily accessible from any device; users get to enjoy access to a full range of features across multiple devices. If you are considering Practice Manager Pro it might also be a good idea to investigate other subcategories of Best Law Practice Management Software listed in our base of SaaS software reviews. There are trendy and widely used applications in each software category. But are they essentially the best fit for your company’s specific wants? A market-leading software solution may have thousands of customers, but does it provide what you need? For this reason, do not blindly shell out for popular systems. Read at least a few Practice Manager Pro reviews and mull over the factors that you desire in the software such as the fees, main tools, available integrations etc. Then, choose a few solutions that fit your requirements. Check out the free trials of these apps, read online comments, get information from the maker, and do your homework systematically. This in-depth groundwork is certain to assist you choose the finest software application for your organization’s special requirements. How Much Does Practice Manager Pro Cost? We realize that when you make a decision to buy Law Practice Management Software it’s important not only to see how experts evaluate it in their reviews, but also to find out if the real people and companies that buy it are actually satisfied with the product. That’s why we’ve created our behavior-based Customer Satisfaction Algorithm™ that gathers customer reviews, comments and Practice Manager Pro reviews across a wide range of social media sites. The data is then presented in an easy to digest form showing how many people had positive and negative experience with Practice Manager Pro. With that information at hand you should be equipped to make an informed buying decision that you won’t regret. What are Practice Manager Pro pricing details? What integrations are available for Practice Manager Pro? If you need more information about Practice Manager Pro or you simply have a question let us know what you need and we’ll forward your request directly to the vendor.